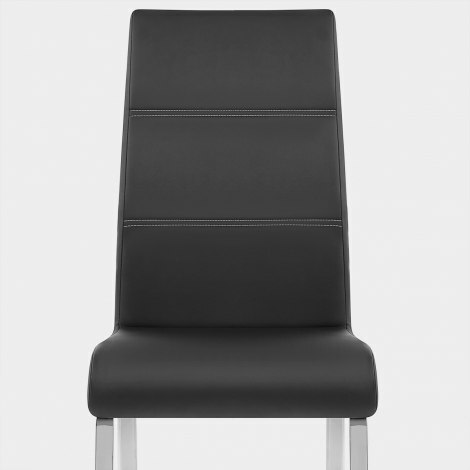 The Sherman Dining Chair Black has a stylish contemporary look that you and your guests will love. A modern delight set to enhance your dining area with its fashionable charms, the Sherman is a simple yet stunning model that invites you to relax. Upholstered in practical black faux leather, its seat is comfortably cushioned, with a tall, accommodating backrest providing premium support. For a chic contrast, stylish white stitching creates a segment detail in the backrest, lending this model an elegant aesthetic. The practical Sherman stands on a sturdy frame of four polished chrome legs, complete with protective plugs to help to protect your floors. "Really nice comfortable chair for our dining set"
Great company to order from, very quick delivery and chairs are of a good quality and easy to assemble. Ordered 3 of these chairs. All came next day, well packaged & easy to build. They are great quality and look fab! The chair was great and value for money. I love the prompt delivery by the company. Excellent quality at a very reasonable price. Ordering and delivery straight forward and on time. We are extremely pleased with the service and dining chair set purchase thank you.